Yes, “they’re real!” mascara caught my attention by promising false looking lashes with volume, length and curl. This product is on the expensive side costing about. The first thing I noticed when I opened it is that I really like the brush. It is a stiff, plastic brush and also very large which I really. The consistency is also great because it is not flaky or too runny. I put one coat on in the picture and I am fairly impressed with it. In one coat I can almost get my lashes up to my eyebrows! It separates my lashes well and I love how jet black they are. I do not think the picture does this product justice. It is not waterproof but my allergies were acting up with my friends cat and my watery eyes did not make it run. 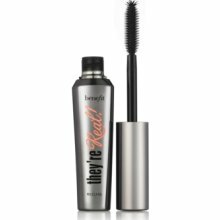 The formula does not flake and I even got a few compliments on my lashes. I really like this product but I would like to do one eye in this benefits mascara and the other in CoverGirl Lash Blast mascara which I reviewed before because the formula and brush seem similar so I am curious to see which works better since the price is a huge difference.